This is the recipe I used to help earn my Girl Scout Cooking Badge. Nut brittles don’t need to be purchased from a store, you can make them at home, best of all you can choose what nuts you use, be sure to use raw nuts. If you use nuts that are roasted they will burn during the cooking process. 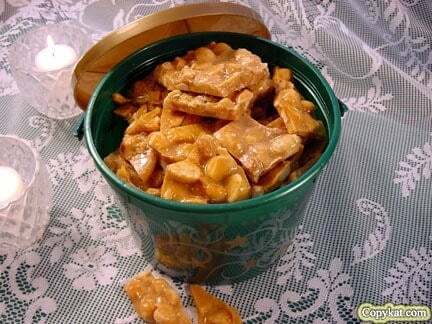 Love peanut brittle, you can swap the peanuts for almonds. Combine sugar, corn syrup, water, salt, and butter in a large pan. Cook stirring constantly, until sugar dissolves. Cover pan one minute to slide sugar crystals from side of pan. Uncover pan insert candy thermometer, cook until mixture reaches soft crack stage. Remove from heat and add nuts. Place back on heat and cook until hard crack stage. Remove from heat and add baking soda. Mix well. Let foam settle just a little before spreading on a well-buttered cookie sheet.